The monkeys were used for experiments on the brain, for Parkinson’s and Alzheimer’s disease. The video shows macaque monkeys in sterile cages, the irreverent handling of the staff with them and preparations for brain experiments. The monkeys live for years in cages of about one cubic meter. They are made artificially ill and live with implants in their skullcap. These pictures in the Video were filmed in the basement of a Paris hospital. To develop Parkinson’s disease, monkeys are poisoned with the Nerve poisont MPTP. Unable to feed themselves, they must be stuffed. A researcher calls this “just about to die”. They are kept in individual cages and poisoned. The French organization “Animal Testing” took pictures with a hidden camera in the basement of a hospital in Paris. 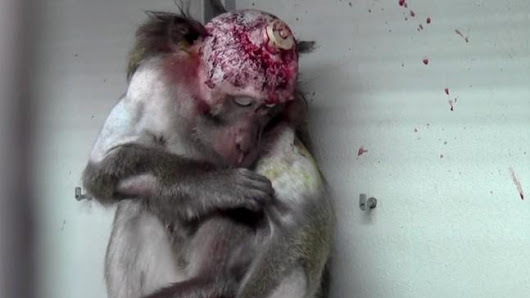 The suffering of the animals in animal experiments is immense. The laboratories are massively scrapping and doing their utmost to ensure that the horror does not reach the public. Authentic images are extremely hard to come by and only possible through such undercover actions as shown here. Witness Call – PLEASE SHARE! Students, researchers, zookeepers, veterinarians, laboratory workers: you are witness to abuse, suffering, or difficult experiments. Report to us!